Good Muslim Girl's Blog | Good things come to girls who pray! Good things come to girls who pray! Golden Domes and Silver Lanterns, A Muslim Book of Colors, is a beautifully illustrated book which celebrates Islamic culture and tradition and all the rich colors that a child can easily encounter in daily life. Hena Khan has written children’s books on a wide variety of topics, and she takes particular interest in writing about her Muslim culture. She lives Rockville, Maryland, with her husband and sons. Eid Creations Cupcake Holder and Topper! Look out Etsy, here we come! Good Muslim is coming to Etsy! 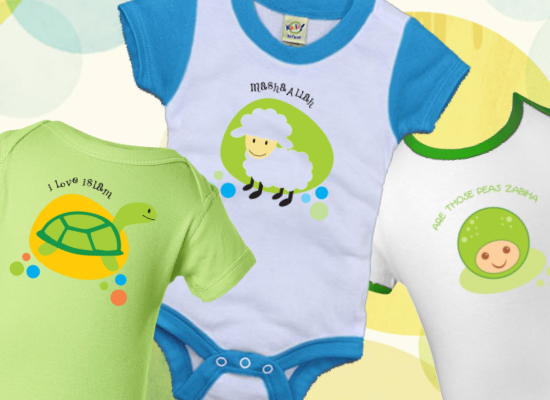 Cute Baby Onsie We Love! Super cute onsies that make great gifts!